The wonders of the Eternal City never end. Here’s a short list of places that will leave you in awe. Rome famous keyhole: on the Aventine Hill, the gateway to the order of the knights of Malta has the most famous keyhole in the world. The Mouth of Truth in the portico of the church of Saint Mary in Cosmedin, a simple sewer cover with the face of a sea god from Roman time supposed to chop the hand off of anyone with a guilty conscience. 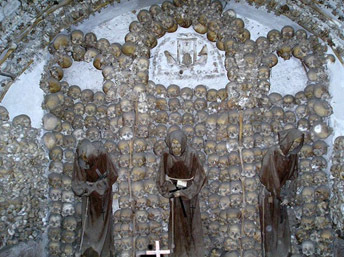 The crypt of the Capuchin monks under the church of Saint Mary of the Conception. Five chapels decorated with the skulls and the bones of the monks who used to live in the adjacent convent. The Janiculum cannon which fires every day at noon, it is the official signal for all the bells in Rome to toll.